Many vendors who sell puppies at flea markets maintain kennels that display all the features of puppy mills. 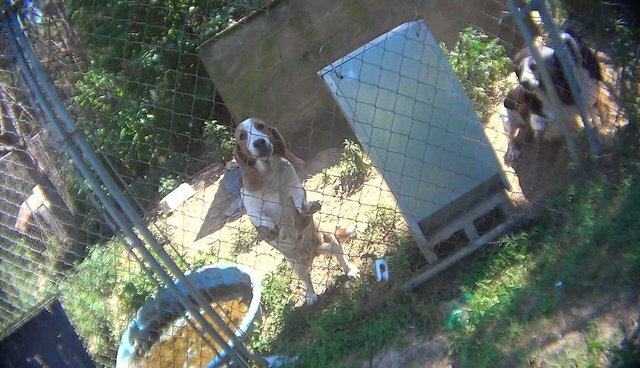 Our investigator found breeding dogs confined in rusty wire cages no bigger than a rabbit hutch, and kept within outdoor chain link pens peppered with feces. Many dogs get little or no human contact or socialization, while some showed showed signs of illness. A vendor at the Curry Trade Grounds, aka "Dog Alley" in Canton, Texas, stated that "there are more dogs that die from here from parvo than anything else." At a breeding kennel that sells at flea markets, one dog's water bowl was filled only with brown slime. At other kennels, the drinking pans had feces floating in the water, or no food or water in sight at all. With no state or federal inspections, the flea market circuit is a nightmare of substandard conditions for the animals. In southern states, the dogs are in the sweltering heat all day long. Several flea market vendors admitted on hidden camera that dog dealers abandon dogs they can't sell at the end of the trading day. Many of the flea markets we visited are in areas already full of stray dogs, with no local shelter to take in the abandoned pets. One vendor said unsold dogs are set loose if they are not sold at the end of the market day. We've made major progress in cracking down on puppy mills over the years, with states setting standards for commercial dog breeding, and municipalities restricting the sale of puppy mill dogs in pet stores and driving the market toward adoption and responsible breeders. With the US Department of Agriculture now barring imports of dogs from foreign puppy mills, and beginning to regulate large-scale breeders that sell puppies sight unseen over the Internet - two rules adopted after a long campaign by The HSUS - flea markets are one of the last unregulated marketplaces for questionable puppy sellers. Our animal rescue team has saved dogs from at least three different puppy mills that sold puppies at flea markets. These operations were some of the most squalid dog breeding factories that our team had ever witnessed. Several states, including Louisiana, Nevada, Oklahoma, and Virginia, have laws that restrict the open-air sales of puppies at flea markets, swap meets, and at other roadside venues. And in states without these rules, increasing numbers of public markets are making the sensible decision to stop or phase out the sale of live animals. On Aug. 29, we assisted the Gibraltar Trade Center, a large public market in Mount Clemens, Michigan, in implementing a "puppy friendly" policy. The market's new policy does not allow any animal sales at all, but welcomes adoptable dogs, cats and birds from Macomb County Animal Control. Trade centers like Gibraltar are paving the way for a new humane economy. You can help encourage other markets to make the switch, and also advocate that state lawmakers impose bans on the fly-by-night dealers selling dogs at these markets. Please contact The National Flea Market Association and ask its leaders to prohibit the sales of puppies at the flea markets they represent. Top photo: Breeding dogs with brown sludge instead of water at a puppy mill called Sportin' Chance in Lyons, Georgia, that sells to Keller's flea market in Savannah.